Watch full Ginga Eiyuu Densetsu Season 2 Episode 28 English Subbed full HD online. Ginga Eiyuu Densetsu Episode 54 English Subbed online for free in HD. Long Live the Emperor! (Sieg Kaiser). Yang boards the Brunhilde and meets with Reinhard. Yang declines an offer by Reinhard to the position of Imperial Fleet Admiral, instead preferring to retire to a quiet life. 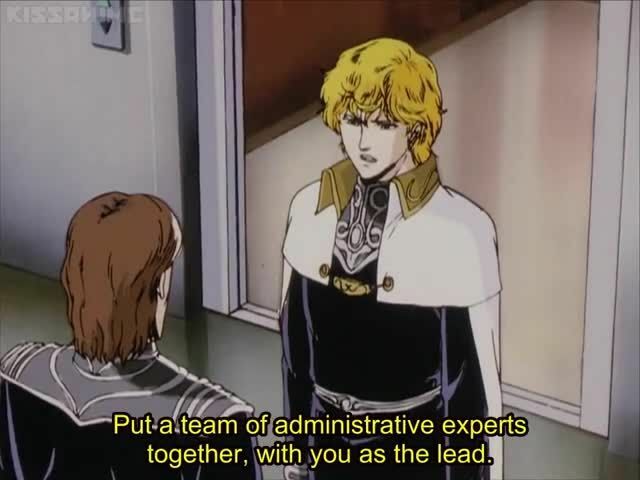 Reinhard and Yang discuss government and philosophy. The treaty of Barlat is announced, formally ending hostilities. The concessions within the treaty increase civil unrest, public anger turns from the Empire to former Chairman TrÃ¼niht. Admiral Lennenkanpt is appointed Imperial consul of Heinessen. Julian, Mashengo, and Boris Konev prepare to visit Earth. June 20, 799 S.C. / 490 I.C. : The regent of the young Empress signs a declaration abdicating the throne to Reinhard. Beginning of the New Empire; year 1 of the New Imperial Calendar (N.I.C. ).